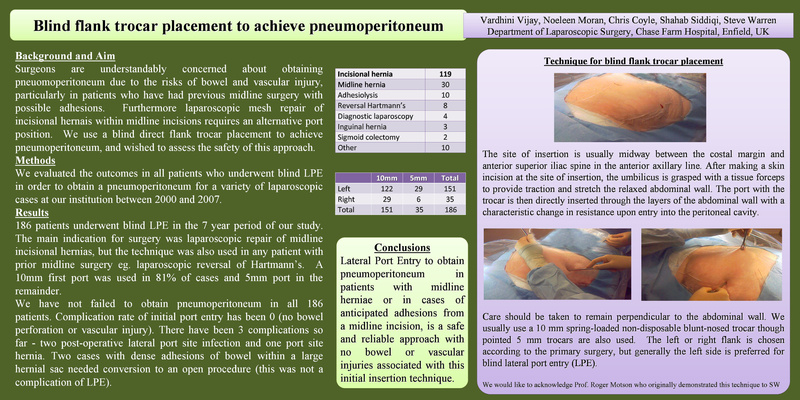 Aim: To evaluate the safety of blind Lateral Port Entry (LPE) to achieve a pneumoperitoneum for laparoscopic surgery. Background: Surgeons are understandably concerned about obtaining pneuomoperitoneum due to the risks of bowel and vascular injury, particularly in patients who have had previous midline surgery with possible adhesions. Furthermore laparoscopic mesh repair of incisional hernais within midline incisions requires an alternative port position. We use a blind direct flank trocar placement to achieve pneumoperitoneum, and wished to assess the safety of this approach. Methods: 186 patients underwent blind LPE in order to obtain pneumoperitoneum for a variety of laparoscopic cases between 2000 and 2007. The main indication for surgery was laparoscopic repair of midline incisional hernias, but the technique was also used in any patient with prior midline surgery eg. laparoscopic reversal of Hartmann’s. Usually, a 10 mm spring-loaded non-disposable blunt-nosed trocar was directly inserted midway between the costal margin and anterior superior iliac spine, with a characteristic change in resistance upon entry into the peritoneal cavity. The left or right flank is chosen according to the primary surgery, but generally the left side is preferred for LPE. Results: Pneumoperitoneum obtained by LPE was obtained via a left lateral flank approach in 151 patients, and by the right flank in 35. A 10mm first port was used in 81% of cases and 5mm port in the remainder. Complication rate of initial port entry has been 0 (no bowel perforation or vascular injury). Furthermore we have not failed to obtain pneumoperitoneum in all 186 patients. There have been 3 complications so far – two post-operative lateral port site infection and one port site hernia. Two cases with dense adhesions of bowel within a large hernial sac needed conversion to an open procedure (this was not a complication of LPE). Conclusions: LPE to obtain pneumoperitoneum in patients with midline herniae or in cases of anticipated adhesions from a midline incision, is a safe and reliable approach with no bowel or vascular injuries associated with this initial insertion technique.